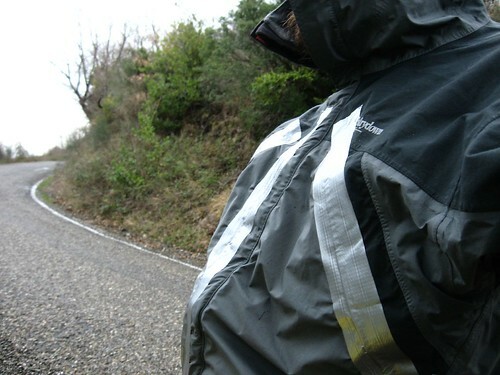 After a very wet dash to Inebolu Town a few days ago, Jean, a visitor to the 14degrees website, suggested that I duct tape over the zips on my jacket to stop water from getting in through the zips. Jolly good idea, so much so that when it started raining today, I did just that. Worked a treat too. Only one small problem, and that is that water wicks under the tape via the outer fabric of my jacket, causing the adhesive on the tape to unstick. The tape kept much more water out than if the tape wasn’t there, so a success. Cycling in cold rain (the temperature was 3 degrees centigrade) is no fun however, no matter how sealed up you are. With the big climbs again today, I was sweating in no time. Wet from the outside, wet from the inside. As soon as I stopped, I got cold very quickly. At one stage I decided to wait for the rain to stop. I hid in a bus stop. The rain however wasn’t cooperating, so I headed out again. Lunch was an hour late, at 2pm in Cide, a town of 9,000 people. In summer I imagine it is quite the tourist spot. The day had a warm ending however. I was hoping to get to Kurucasile for the night, however it was already 6pm by the time I descended into Kapisuyu I (there was Kapisuyu I and Kapisuyu II). Kurucasile was a tantilising 4km away, but was separated by a 300m high point. I tried to climb up over the point, but half way up my legs quite firmly refused. ‘Ah, no. No Robert, we are going no further’ they said. I rolled back down to Kapisuyu in search for food. It was raining lightly. I stopped at the only store in town and bought some bread and milk. 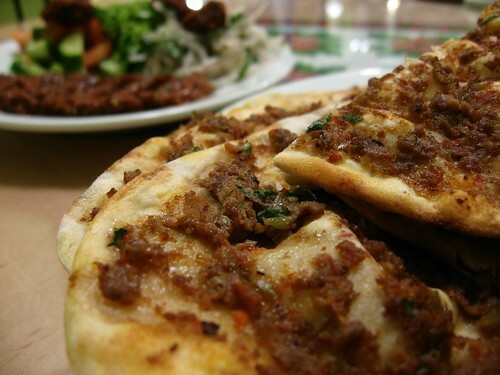 The owner of the store, Mr. Behzat Guler, suggested that I eat next door at his small cafe. ‘In summer it is very busy here’ he said. Tonight it was dead. Him and his wife watching TV. I ate my bread and a delicious sweet desert thing I didn’t think to ask the name of. I motioned to pay for the delicious sweet desert thing I didn’t think to ask the name of, and Behzat firmly refused to accept anything. I said that I had a tent, and asked where I could pitch it in the small town. 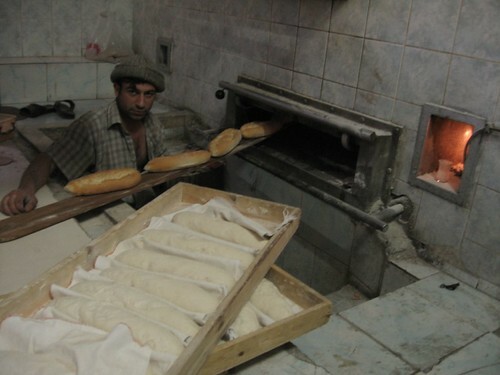 Behzat would have nothing of it, and that’s how I ended up sleeping in his warm little cafe for the night. Thank you Behzat! 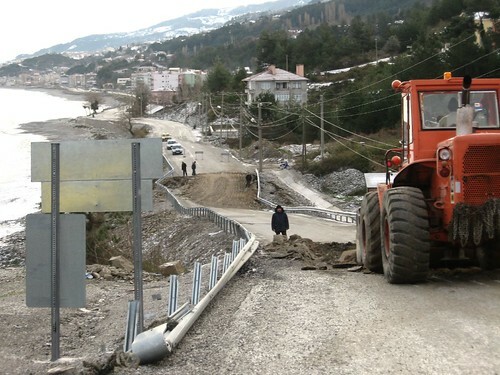 The weather forecast for today promised a one day break in the tough weather that has been lashing the middle section of the Black Sea coast of Turkey for the last few days. The forecast made good on its promises, and I managed to cycle about 75kms along the coast’s inhumane inclines before settling down in one of the many deserted campspots. Only a few kms from Inebolu however, I had my first hold up for the day. The storm yesterday had caused a section of road to collapse, requiring some emergency maintenance work. Cars were lined up on both sides of the slump in the road, but I was waves through after a few moments wait. 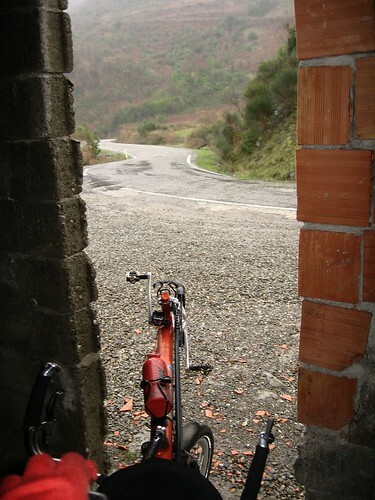 I cycled gingerly over the slumped road, making sure to dodge the wide cracks in the road. The hardest thing about today’s snow was that in places it had been compacted by cars, which left an uneven slippery surface. 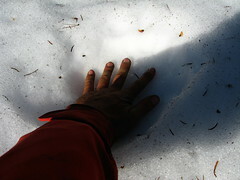 In some places the snow had turned to slush, in others it was still hard. Potholed ice, I call it. The inclines were steep. In places I had to push the bike uphill. I was beginning to wish I had some spiked tyres as Satoshi, a regular visitor to my site, suggested. 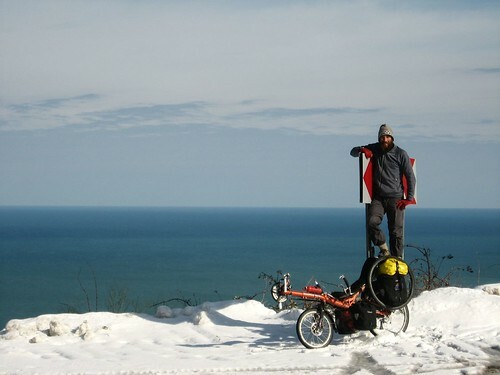 The snow only lasted until Doganyurt however, and from there I was able to savour the inhumanely steep Turkish Black Sea coast hills in all their glory. The views in places were stunning. It wasn’t until it was growing dark that I spied a potential spot to sleep. I was up at the top of a point, and down below was a beach in a small cove. There were a few buildings in the cove, well away from the small town further up the valley. I bombed down the road to the cove. There were some people in one of the small houses - a family from Istanbul, on holiday. 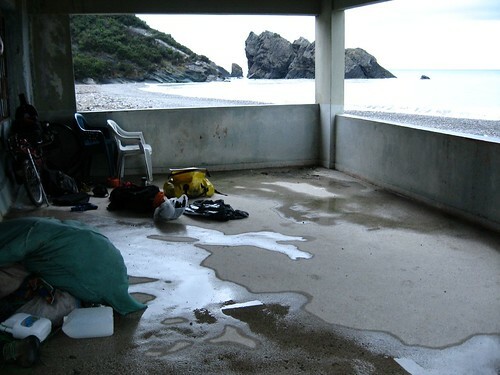 I asked where I could pitch my tent, and they suggested I sleep in the porch of one of the buildings nearby. 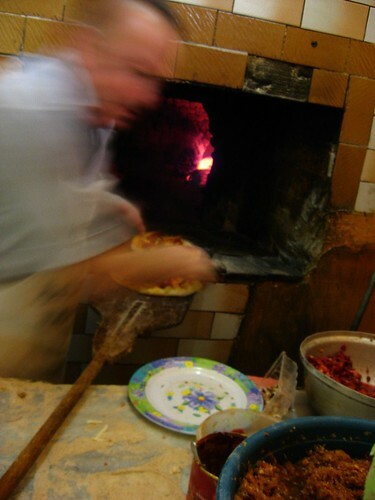 Dry and relatively warm, I had just finished cooking up some soup and pasta when the father of the family from Istanbul appeared with a massive plate of fried fish and another massive plate of salad. I ate my fill that night. Oh yeah, gimme some of that. Gale force winds continue today. My little walk along the shores of the Black Sea this morning was a tough one. At times difficult to maintain balance, I decided that if it’s this tough just walking, that cycling would be impossible. Horizontal snow followed soon after I shot the clips. Oh well, looks like another day inside, eating. 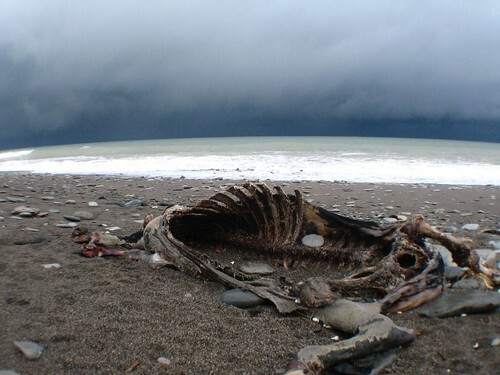 By the way, a few people have asked me if I know why the Black Sea is called the Black Sea. I consulted Wikipedia, and it appears that there are a few possible reasons. Yesterday’s weather forecast was a day late, it seems. 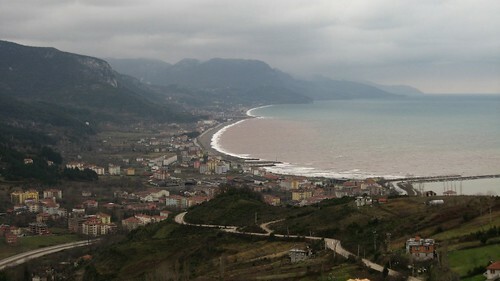 The predicted snow, rain and wind came in force today, soaking me through on the 11km ride from my campspot to Inebolu. As I sit here in the internet cafe, it is still snowing the same slushy, haily gunk that the sky spat on me early this morning. My waterproof gear is great in its intended use, but when I am lying back on my recumbent, water gets through the front zips. Not pretty. Before the skies dumped their contents on me however, the views from my campspot were thrilling. The wet weather even made my dead neibour let up her stinking for a while. The weather forecast for today was rain, snow, and wind. I saw none of it, and had a great day of riding. 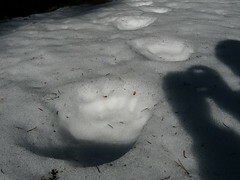 Snow and ice still remained after yesterday’s full day of cold rain and following snow during the night. 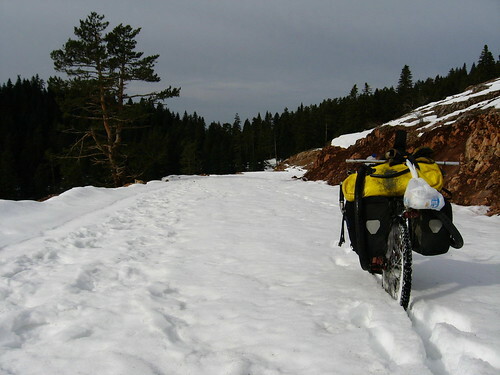 It was at times hard going up the very steep hills between Ayancik and Turkelli. The road had been cleared by a grader in the early morning, but the thin layer of snow that ramained meant that I had to concentrate on keeping the bike rolling over clear road. If not, the back wheel would spin. 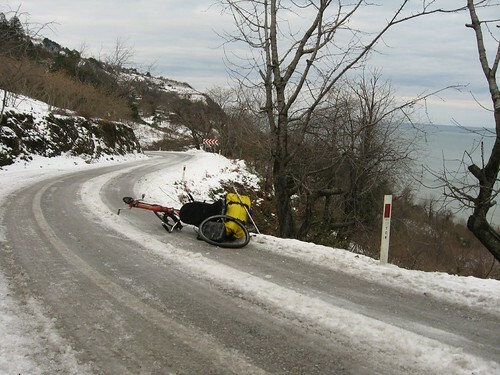 I had read Peter Wulff’s account of his cycling along the Black Sea coast of Turkey yesterday, and according to him, there were some big hills. He is not wrong. 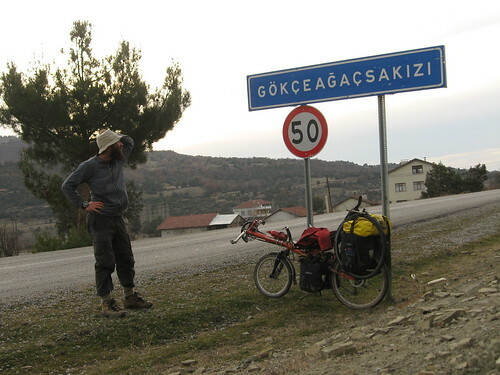 The hills in this part of Turkey are the steepest I have cycled anywhere on this journey. I have only once ever climbed faster than 14m/min on this journey, and that was in Dushanbe in Tajikistan while cycling around the city on an unloaded bike. I was doubting the accuracy of my map when it said it was 30km from Ayancik to Turkeli. The towns looked so close together. At least, as far as the crow flies they are. 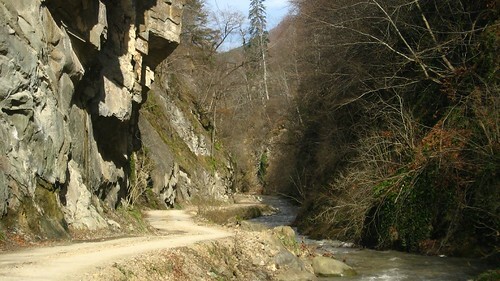 The road however snakes up rivers and up to about 400m above sea level before once again dropping down to Turkeli. The hills continued in this way for the whole day, but I was feeling strong and enjoying the challenge. 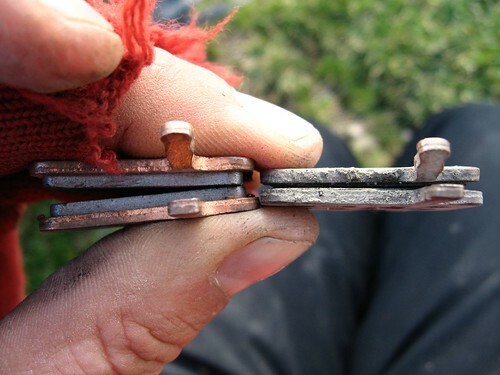 The steep downhills took their toll on my brakes however, and soon my front brake pads, which had not been changed since Uzbekistan, began making the tell tale sounds. A simple two minute replacement job done, I was on my way again. By the way, the next time I embark on a journey, it will be done like these guys. I met these Three Norwiegans (Nikolai, Per, and Øyvind), on the approach to Inebolu Town. They began their round the world tour on scooters in New York. Legendary. Meeting them made my day. Full respect to the classiest transport on the planet. They have a website! 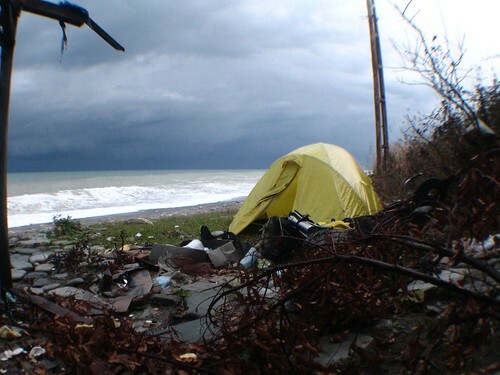 I found a nice campspot right on the beach about 11kms from Inebolu. I made sure to pitch the tent upwind of the rotting dead cow though. It was windy during the night. I recalled seeing on the internet that the weather forecast for today was for snow. I have to get off this mountain. I got up before day break, and battled with the cooker in the wind to boil some rice for breakfast. I checked my barometer often to look for any tell tale drops in pressure, indicating the oncoming of precipitation. It had only dropped 4 bar in the last 7 hours over night however, so I was safe for the time being. As the sky grew light, I could see that the feared snow clouds had not yet appeared. A blue sky to aid my escape off the mountain to Ayancik. I gave Akgol Lake one more longing glance before pushing my bike back to yesterday’s fork in the road. I studied the signs once again, while I filled my water bottle. Now that’s odd, why didn’t I notice that yesterday? 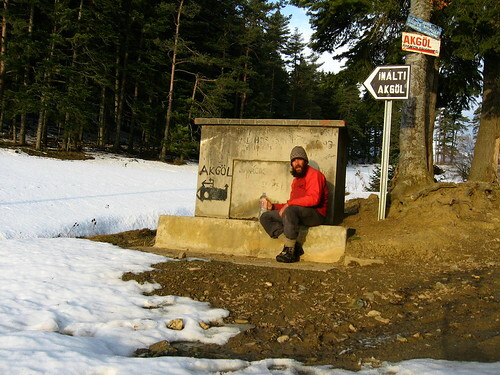 On one of the signs that pointed to Akgol, was ‘Ayancik Belediyesi’ in small lettering. My Turkish phrase book told me that ‘belediyesi’ means city council. The road to Akgol leads to Ayancik after all! I thought with jubilation. 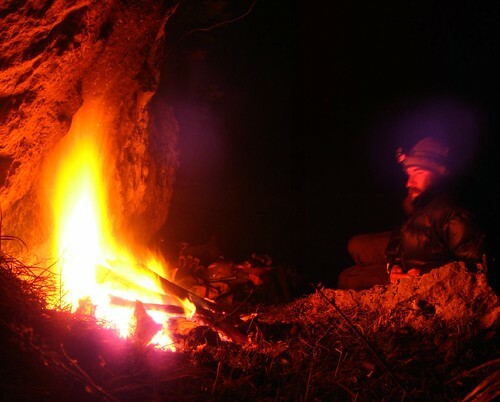 I re-resolved to go to Akgol, and then follow the road to Ayancik. Pushing my bike back past my camp spot towards Akgol was easier than the day before. With yesterday’s tyre tracks, I was able to push the bike without having to cut tracks in the snow. The road going from where I camped to Akgol was for the first half what I had hoped. 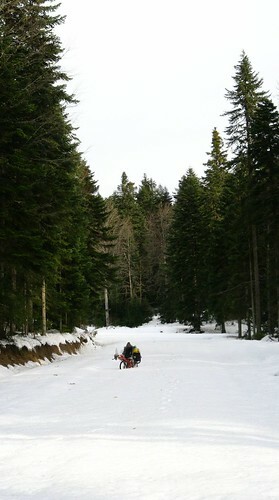 Snow shallow enough to be able to sit on the bike and roll down hill. This only lasted for about 100m however before once again the road went behind the trees, and the snow was in its full unmelted glory. I repeated yesterday’s process of removing the front panniers and walking them about 1km ahead. I walked them all the way down to the lake. There it was. 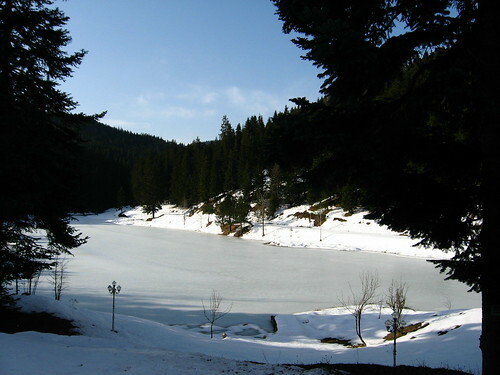 Lake Akgol. In summer I imagine it must be quite the picnic spot. Today there was no one. The lake was frozen over. Massive chunks of snow had fallen from the roof of the adjacent council administration building, bocking the doorways. The road did indeed carry on down the valley next to the river. But it was such a tiny road. And covered in deep snow. Is this really the way to Ayancik? Perhaps the reference to ‘Ayancik City Council’ on the sign back up at the fork in the road was referring to the administration buildings. I tried breaking into the administration building to try to find a detailed map of the area, but the windows were closed fast. I decided that assumption being the mother of all stuff ups, I would turn back. I kicked the snow in frustration and yelled at nothing in particular. Or maybe I was yelling at common sense. 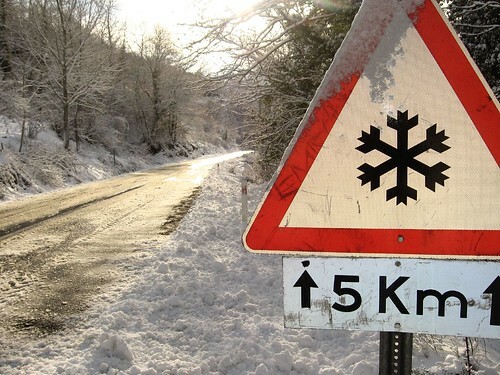 Mr Common Sense, who always knows better, when I am so sure that the small snowy road goes down to Ayancik. I firmly told me, myself and I that the decision was made. So I picked up my panniers and trudged off up the hill again to my bike. As I walked I noticed the biggest footprints I have ever seen in my life. I would later learn that there are bears around Lake Akgol. Ignorance is bliss. Once at the bike, I began pushing it back over the tyre tracks once again. The going was easy enough, but pushing uphill required a rest every 5 metres or so. It was going to be tough pushing the bike up yesterday’s hill, but all going well, I would be back on a clear sealed road by late afternoon. Just as I rounded the corner to the fork in the road, I saw it. The most beautiful sight I had seen in two days. A huge grader was carving through the snow, leaving a beautiful clear road in its wake. A man was walking towards me with a small bore shotgun hanging over his shoulder. 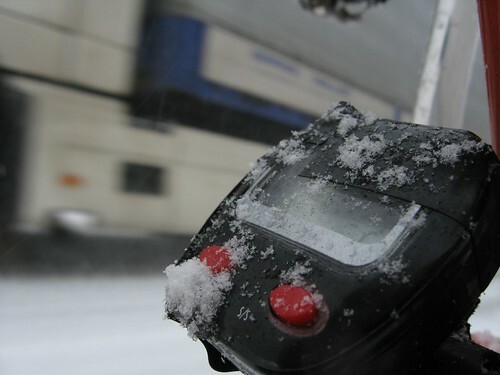 The man didn’t seem at all surprised to see a foreigner pushing a bicycle-like contraption through the snow. I asked him which was the way to Ayancik. To the right, he motioned, and that was that. A true answer to my prayers. The road went over a small crest before easing into the most spectacular downhill ride of my life.. 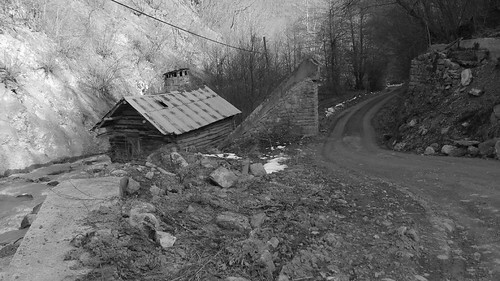 The road was mostly clear of snow, and went through villages that clung to the mountainside for dear life. Locals waved in confusion as I sped by. A little toddler saw me coming and ran for cover, sneakily watching me roll by from behind a fence post. The road descended down to join a road that followed the river downhill. A sign pointed upstream to a tourist spot called ‘Akgol’. I didn’t care any more. The riverside road was glorious. Walls of rock, waterfalls, steep hard packed road. The recumbent was in its element, only slowing for blind corners where the likelyhood was high that a local would be speeding up the hill just as fast as I was speeding down it. I finally reached a sealed road. The road that I would have been on had I just gone downhill yesterday rather than be lured down the road less traevlled to Akgol. I couldn’t help but think that it is indeed more worthwhile taking the road less traveled. You are sure to suffer, hurt, curse and get frustrated. 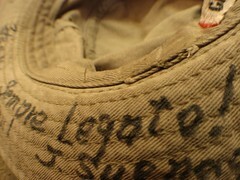 But in the end you’ll always come out the other end with more than a tale. 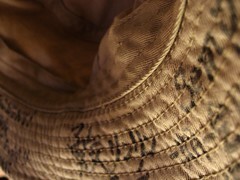 You’ll have spot in your memory that will always take your breath away every time you revisit it. I bombed down the asphalt to Ayancik. 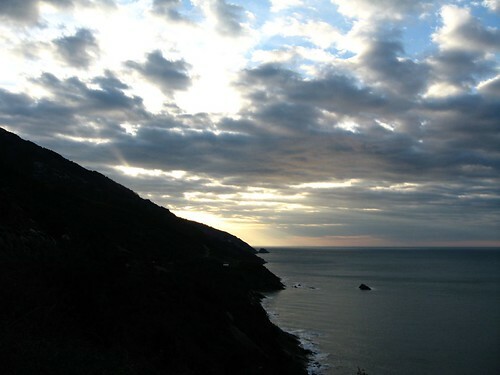 I caught glimpses of the Black Sea as I descended. 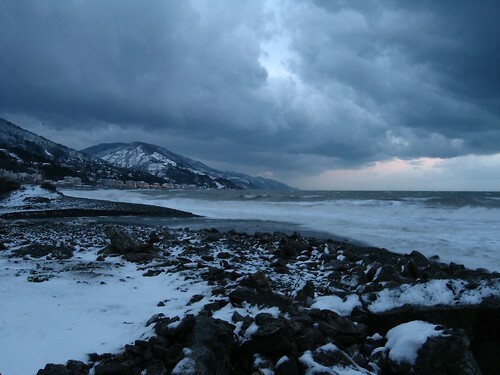 The Black Sea. I was euphoric. What on earth is a guy from the one of the southern mot cities in the world doing looking at the Black Sea with his own eyes. I checked into a hotel (rain was beginning to fall) and washed my clothes for the first time in three and a half weeks. There’s nothing quite like a 40km downhill to get the spirits up. Before leaving, I stopped in at the baker’s for some bread. Jolly interesting, these bakeries. I was on the road by 7:20am. I love being on the road early. You cycle for three hours and it’s still morning. That’s a great feeling. As hoped, the wind was a tailwind. It was blowing hard, but not into my face. The downhill lasted for more than an hour and a half. However, by the time I was at an altitude of around 1200m, the snow had turned to rain. With Susehri only 20km away, the fact that I was going to be drenched didn’t matter. The weather forecast for tomorrow looks better, so I’ll be out of here early.